Have I ever told you the story about how I never cook anything difficult, because I'm lazy? Well the story continues… This meal is fast & simple. 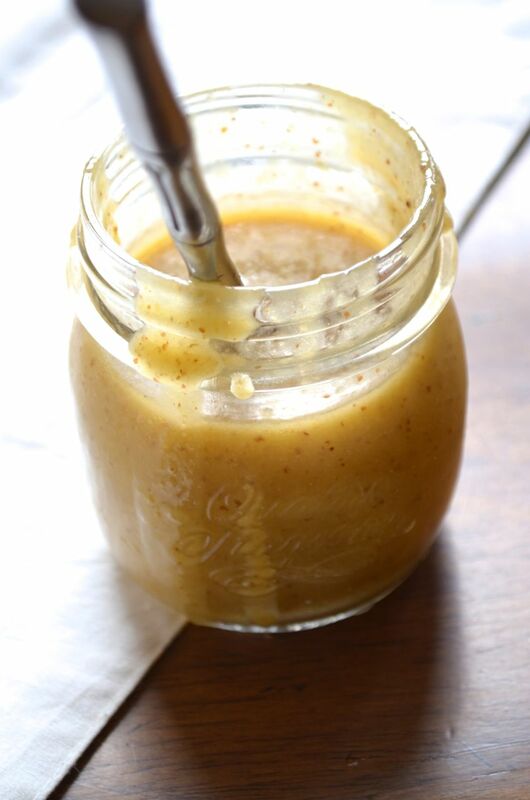 My lemon-chili dressing is vegan- completely free from sugar, gluten, dairy and bad vibes….and it's awesome. The velvety texture of the butter lettuce and avocado is so nice with smoky grilled shrimp and tomatoes topped off with a rustic, lemony dressing. I hope that you'll agree! 1. While your grill is heating up, make the dressing. In a bowl stir in all of the ingredients except for the oil. Slowly stream in oil and stir until completely emulsified. Set aside. 2. Skewer your clean shrimp and tomatoes. Drizzle with olive oil and season both sides generously. When your coals are nice and white, gently cook the shrimp and tomatoes. You're shrimp will only need about 2 minutes per side. The tomatoes are ready when the've softened and are nicely charred. 3. Assemble your greens. Add avocado, tomatoes and shrimp. Top with dressing, cilantro. Serve hot or cold. First Honey Mustard and now this? I'm on a salad dressing & dip kick, so please, bear with me. If you make my salad dressings you will be disappointed with store bought dressings. There's such a difference! I know they're good because I can eat 'em from a spoon. Or maybe it's because I'm just crazy? Don't answer that. This is Lavender's favorite salad dressing! She's seven, so she knows what's up. She raves about it and tells me it's the best thing that I make. What Mamita isn't proud when she sees her kids enjoying salad? I call it "The Ranch Hand" to make it feel kinda rugged and manly. 'Cause, besides Lavender, I know there are some dudes out there that ONLY take Ranch on their salads. It's Hidden Valley without the garbage & no mayo, hooray! Put warm, crispy bacon and a generous dose of "The Ranch Hand" on your man's salad. He'll Yee-Haw for sure!! This is the perfect ranch dip for veggies! Run the garlic through your food processor, until minced. Add sour cream, buttermilk, lemon juice, salt, pepper, cheyenne pepper and mustard powder. Run food processor to combine. Add minced chives, pulse 4 times. Before serving, refrigerate to thicken and allow the flavors to develop. Are these mini milk bottles the cutest things ever? Find them here. The caps don't fit very tightly, but I think that they're adorable. If you've ever lived in the South, I'm certain you've acquired a taste for somethings that some other people just wouldn't understand. For me it's sweet tea, cajun boiled peanuts, fried okra, creamed corn and honey mustard. I've kicked that nasty, sweet tea habit. I'm 5lb lighter because of it. Anyway, honey mustard! It's not the "chic-est" dressing but (of course) I think my recipe is sooo "Southern Belle chic." It's perfect on a grilled ham and cheese. I wasn't going to say it, but yes, chicken tender dippin' is allowed. 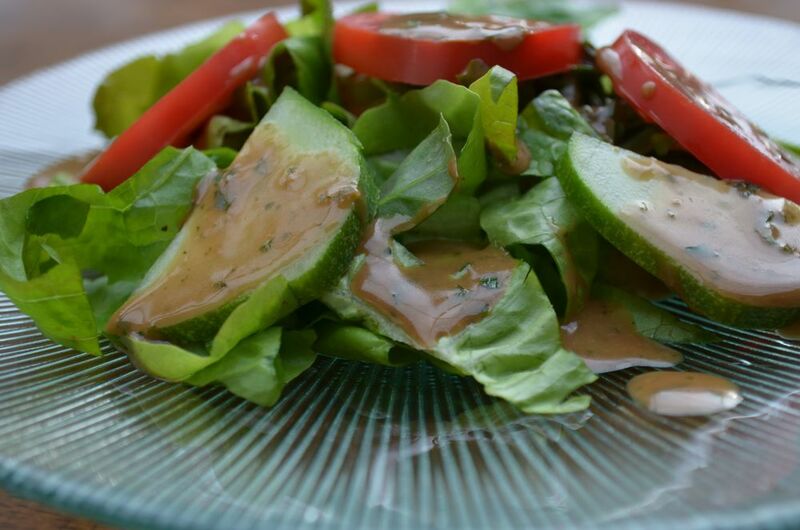 This is for the good folks out there who love sweet & tangy salad dressing. Did I mention that it’s so good? I think it's because of the buttery, caramelized onion...shhh, that's my secret. On medium heat, in a small pan, caramelize the onion in butter, really cook it down, salt lightly. Add the onion and the rest of the ingredients into your food processor and let it run until it's smooth and creamy! Note- If you want to serve this with chicken, pork or something, you can warm it in a small pan on low heat. Refrigerate for up to 2 weeks. Stir and let sit out for a few to soften. If any of you are from the South you better holler at me from the comment box! Later friend. I'm super busy right now getting ready for our upcoming move, so I'll make this short. If kimchi was a marinated cucumber salad, it would taste like this! If you want to add the creaminess of avocado, I've included the option for, it in my recipe. Either way it's good, okay!! Trust me. Combine all of the ingredients in a bowl and toss gently. Garnish with more basil, sesame seeds and Siracha if you wish. Note- If you're using avocado I would serve it promptly, if it's only cucumbers you can let them marinate for a while. Wouldn't this be yummy served with Chicken Satay? This grilled chicken Mexi-salad is perfect for your next fiesta! It's a fresh, festive dinner salad that is packed with flavor! Juicy grilled chicken, zesty veggies, crisp lettuce, topped with a smoky chili vinaigrette and sprinkled with a salty mexican cheese. 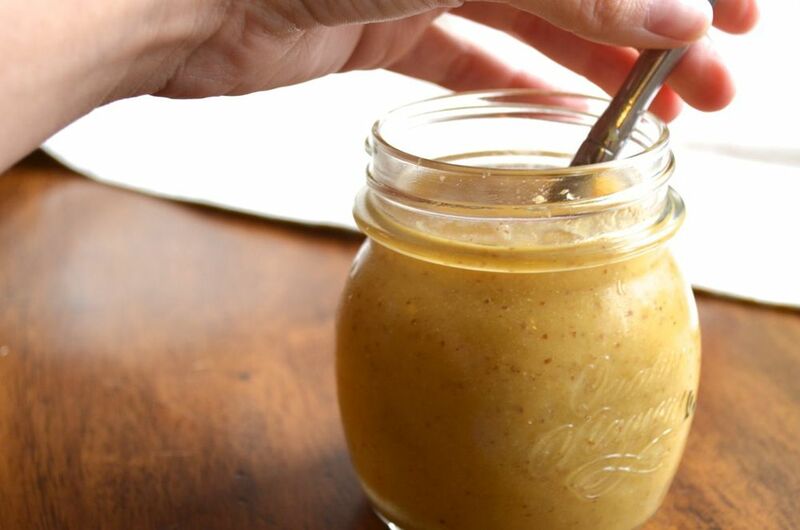 The dressing has a full smoky, slightly sweet flavor...It's out of this world!! Everything in this salad can be made ahead of time and assembled at your convenience. Drizzle chicken with oil, coat in rub and a little extra salt. Grill until cooked through out. Chop diagonally into strips. Can be served on the salad hot or made ahead of time and kept in fridge. Combined all ingredients in a medium bowl. Cover and keep in the fridge. Can be made ahead and stored in the fridge for up to 2 weeks. In a small bowl soak the chilies in 1 cup of super hot water for an hour. On a medium-high stove, in a small pan, dry roast the onion and garlic. The onion and garlic will be done when they're charred and tender. P.S. This salad would be amazing with beans and avocado too! Since I made my Kale, Quinoa, Apple Salad with Lemon-Parsley Vinaigrette, all I have been thinking about is making another kale salad. This recipe is the result of all that thinking! I feel sooo good after I eat Kale. I want to incorporate it in my diet as much as I can. This is the ultimate raw, vegan lunch or dinner!! If you like Asian flavors like sesame, ginger, and soy, you’ve gotta try it! 1/2 c. fresh orange chunks!! In a mini food processor, run the ginger through. Add the rest of the dressing ingredients and run until it’s well incorporated. Add all of the salad ingredients to a large bowl and gently toss in the dressing. Sprinkle black sesame seeds on top. You've heard that pink is the new black? Well, avocado is the new food group.The FDA hasn't said it, but everyone knows that it's true. That's why I am annoying you with yet another avocado, tomato, basil thing, to remind you to get your daily recommended allowance (RDA). I made a tossed caprese salad the other day and it was sooo good I HAD to think up another one. 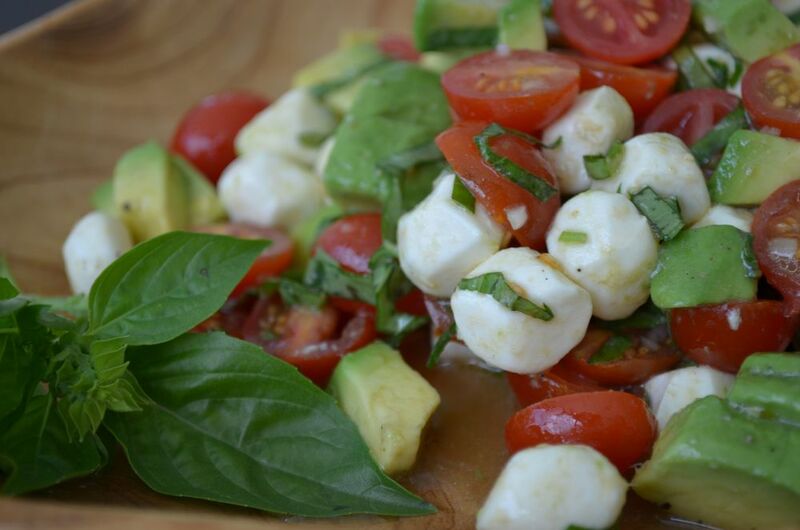 This one features avocado, mozzarella, tomato and basil tossed in white balsamic vinegar and oil. Simple!! Make it when you cook out, make it for a party, make it for your lunch...I don't care, just make it! Lightly toss ingredients together in a large bowl. Well, the truth is, I don't got no stinkin' Cinco de Mayo post. That's a big Buena Vida FAIL. I did the same thing for Valentine's day! I had a great idea for a romantic cheese board for two, I even bought fine cheeses, but sadly no cupid post. Grilled Vermont Cheddar, Wilted Arugula & Sweet Caramelized Onion Sandwiches servered with a Bite-Sized Caprese Salad. I'm calling it "Summer Grilled Cheese" because that's what it feels like outside. If you're making both recipes, make the salad first and refrigerate until the sandwiches are ready. Toss ingredients together in a large bowl. Yep, that's it! Slice your onion. In a pan over med/high heat, caramelize your onion in butter. Sprinkle lightly with salt and set aside (this can be done ahead of time). Next, butter you bread on one side and assemble your sandwiches with cheese, arugula and onions. Over a (pretty) low setting, slowly grill you sandwiches until the cheese is melty and the bread is toasty. I got my laundry done! Are you amazed? I haven't mastered many things in life, but I have indeed graduated from the school of perfect salad dressing... My balsamic vinaigrette is rich and thick, not too oily and not too tangy. It's loaded with flavor from fresh herbs and sweet enough to balance the vinegar's acidity. Best of all, it keeps Mr. Buena Vida begging for salad! First, run the garlic clove through a mini food processor. Then, add the rest of the ingredients (except for herbs) and run until it's completely emulsified. Now stir in minced herbs. If you don't want to use a food processor, mince the garlic and herbs. Add all of the ingredients except for the oil into a small bowl. Slowly stream in the oil and whisk until thick and creamish. You'll know to stop whisking when there is no oil ring at the top. Because it's so thick and wonderful a little goes a long way. Keep refrigerated for a couple weeks. After refrigeration stir and set out for a few to soften.